The Bunan family, without resorting to the marketer's tricks of fanfare or hyperbole, have quietly become the single largest proprietors in Bandol. 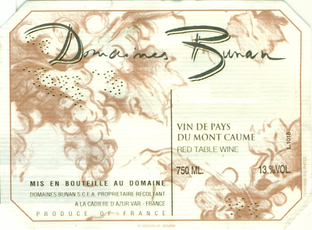 This appellation is arguably one of the top regions in the South of France, and Bunan is among the region's top producers. Ooops, there I go, resorting to fanfare. But it's fanfare that happens to be true. Why I Selected This Wine - unlike many in Bandol, Bunan has not drunk the same potion that has led to the "new oak love affair" amongst many of their neighboring winegrowers. When teaching about wine, I like to describe the judicious use of oak as similar to that of salt - if a chef uses too little the food is bland, but too mch the food tastes of salt. But just the right amount leads to the ultimate experience - food that is neither bland nor noticeably salty! Although Bunan is well-steeped in respect for their region's traditions, they maintain an openness to change, obtaining organic certification for their vineyards a decade ago, and more recently, bio-dynamic conversion and certification. The Wine - For their Vin de Pierre, Bunan blended the region's traditional Mourvèdre with 50% Syrah and the result is delicious. The familiar Bandol nuances are supplemented with the typical lavender notes of Syrah. A well-endowed wine that promises to give pleasure now through 2020. 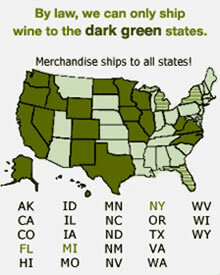 DaveTheWineMerchant.com © 2011. All rights reserved.